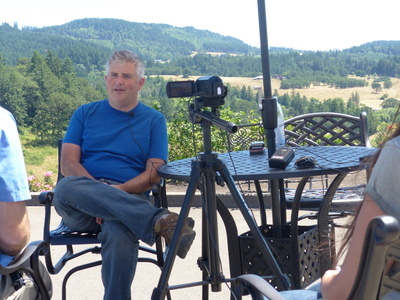 Steve Goff is photographed during an oral history interview at Colene Clemens Vineyards in Newberg, Oregon on July 19, 2017. Goff was interviewed by Linfield College archivist Rich Schmidt. Also in attendance was Linfield College Archives staff Stephanie Hofmann. Steve Goff is the winemaker and vineyard manager at Colene Clemens Vineyards in Newberg, Oregon, a position he's held since 2008. Linfield College Archives, "Steve Goff Interview 01" (2017). Browse All Willamette Valley Oral History Interview Photos. Image. Submission 499.